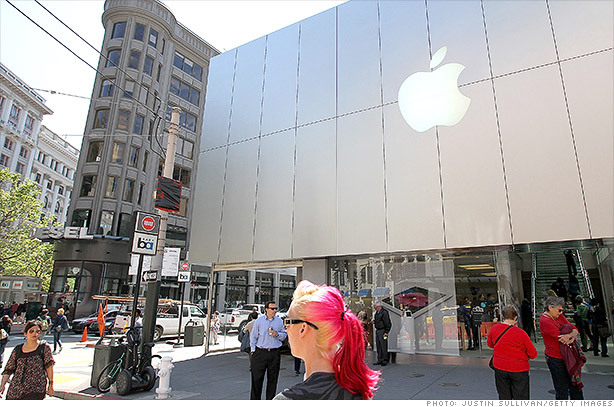 Apple fell below $400 for the first time since mid-April. But let's walk it back even further. After coming under fire for its massive cash hoard, Apple finally came up with a plan to reward shareholders. Only it didn't include dipping into that treasure trove. Instead, Apple decided to go into debt to avoid a huge corporate tax bill. That didn't sit too well with many investors, seeing as that's the last time Apple dipped below $400. It didn't help that Jefferies analyst Peter Misek lowered his 12-month price target to $405 from $420 over the weekend. That may not sound that dramatic until you consider he had an $800 price target on the stock in December. Apple has fallen out of favor this year. The declining share price gave StockTwits traders plenty to chat about. So it's not all bad news for Apple then is it? Of course, don' t get me started on Facebook (FB). Remember the CNNMoney 'I wanna buy a share of Facebook' experiment? Let me refresh your memory... we all lost money. Maybe it's just gearing for a big push higher. Of course, it probably needs a catalyst for that and I don't see one on the horizon at this point. And maybe I spoke too soon. A couple of good earnings and sales wins may be just what the doctor ordered. So basically, there's a whole bunch of undecided out there. $AAPL down almost 8% in 5 days.Makes no sense,but whoever said there was an sense on WS. Truer words were never spoken. I'm still an Apple fan. I just think it's going to take awhile for everyone to adjust to a post-Steve Jobs world.